Green homes help save the environment. With the amount of pollution from everyday life, i.e. exhaust fumes, electricity and pollutant gases from industrial sites, the environment could use every bit of help it can get. Over the past five years, we have seen a huge increase in the amount of homeowners attempting to “go green”, following simple steps such as, switching plugs off, washing in cold water and even installing solar panels on their roof tops. Everything we do has an impact, no matter how little each home helps. However, there are some houses that really stand out when it comes to being environmentally responsible. The following four UK homes demonstrate a huge willingness to help the environment, and probably save quite a lot of money along the way. This contemporary detached home is located deep within the grounds of a grade two listed garden pavilion in South East London. Originally designed in 1978, this property is completely ‘green’, and came in at a building cost of £980,000, a small price to pay for saving the environment. The bottom floor of the Pavilion is earth sheltered, helping the property harness the heat of the soil. As well as this, the rooftop is built to be bio diverse, with solar panels and rainwater, and it also has ground sourced heat pumps. The main part of the home is predominantly built with Purbeck stone, lime render and chestnut cladding on wood fibreboard. The interior is finished using breathable plaster and paints, purposely used to aid the air quality within the home. The pavilion sports huge windows, letting in natural light and creating a beautiful view of the forestry surrounding the property. With all of the above in mind, the Pavilion made itself one of the first private houses to be listed as grade five on the government’s code for sustainable homes. 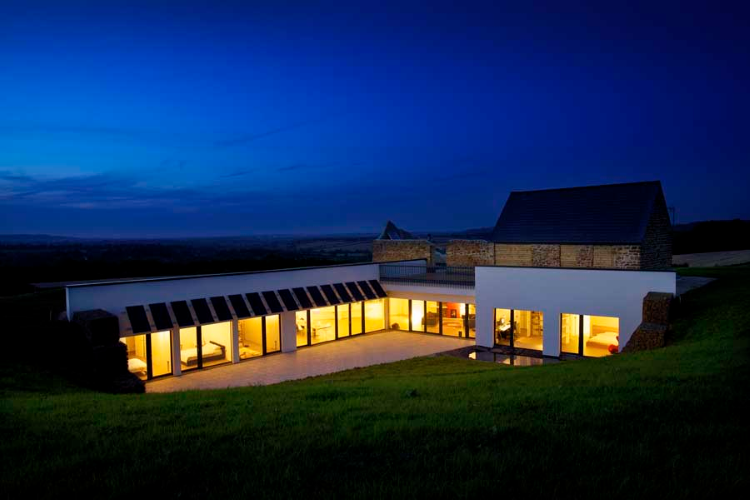 Home to Julian Marsh, this award winning eco-friendly home is said to be a low-energy dwelling that adapts to the seasons. Located in an industrial complex and costing £500,000, the structure of the home is layered, like an onion, and built using hemp insulation, clay plaster and sustainable timber. No heating is needed in this home due to the external stairs and passages that are used to keep in the warmth generated from the sun. As well as this, the ground sourced heat pump generates heat from limestone buried 70m below ground, keeping the property at an average of 19C year round. Their use of stored rain water for showering and washing also saves them money, as well as helping the environment. But no need to waste the rain water on the toilet, as these home owners have opted for the not so traditional use of a compostable toilet. The Marsh family have really gone all out on this home, claiming they no longer use everyday appliances such as fridges and freezers, and state they have in fact lived without these for over 4 and a half years, and instead use a cool, ventilated north facing larder. Located in South London, this three storey translucent house is home to architect Carl Turner. Winning multiple awards, the house is constructed of three different sized boxes, each designed for optimal lighting, as well as serving a different purpose to the house. At the top of the house is an elegant roof terrace, sporting a number of solar panels to generate electricity to the rest of the house. Similar to the Pavilion, this property also uses rain water harvesting techniques, as well as using triple glazed windows and mechanical ventilation systems. So it is no wonder why this property has also achieved grade five out of a possible six on the government’s code for sustainable homes. With a sleek, minimalist and contemporary interior, and costing a little over £600,000, this property has really thought of every aspect needed to become as eco-friendly and stylish as possible. Originally designed by Seymour Smith, this spectacular property is one of only 20 to be allowed to be built in such a naturally beautiful area. Almost completely hidden from sight, this underground property cost the owners around £575,000, so was it worth it? The complete structure of the house is built solely from concrete, providing a strong and consistent structure to the home. The property includes 4 bedrooms, each of which let in as much light as possible. The interior is predominantly decorated using a white paint finish, however it does also include some areas in which the concrete is left exposed, helping the light naturally bounce off the walls. Given that half of the house is burrowed into the ground, the home allows for a lot of heat to be absorbed from the earth, eliminating the need for central heating. This being said, the south facing side is left open and incorporates multiple solar panels and huge triple glazed windows. Now clearly we can’t all be as dedicated to ‘going green’ as these home owners, however making a few simple changes to your everyday life, such as switching off plugs, or washing on a 30 degree cycle could make drastic changes to the preservation of the environment.